Again, we're all speculating. Even the 60 (and counting) pollsters are speculating. Most agree with you, so what's the problem? Like many Fed fans, I'm still getting over the loss to Anderson (who played solid by the way and obviously a little fatigued today). Based on that QF and compared to Djokovic/Nadal, Djokvic/Neishikori and today, I'd have to give it to Djokovic. I'd want it to go to Federer. Amazing stuff from Nadal, Federer (early round dominance) and Djokovic this tournament, props to Anderson too. But what does this say about the rest of men's tennis? Basically Nadal/Federer get to dominate for about 18 months, since no one else can compete until a healthy Djoker is back? My guess is that is all about mental fortitude and belief and the younger generation seems to lack it consistently against these guys. I don't think they lack the strokes or fitenss. I think F is finished! The US Open may be his last major appearance! Dunno about the outcome, but it would have been more fun to watch! The problem with Fed this year has been his movement. He is clearly slower than in year's past and I think he's more focused than ever on keeping points short so he just doesn't move as much as in the past. This is it in a nutshell. And his slower movement clearly is the reason why his FH is so meek recently. It took great speed and perfect footwork for Fed to hit his howitzer FH's in his prime years. That shot has been absent almost all of 2018. It may never come back. Going to have to go with maybe. I'll be jumped on if I say yes, so no. What does the Nadal match tell us about Djokovic’s current form and by relation, Federer’s chances? Before slumping, Djokovic was easily beating Federer. But then again, Nadal was easily beating Federer at that time too, and we all know how the last several meetings have gone. I really hope they meet at the US Open. Of course I hope Federer and Nadal finally meet there as well. 2016 fit Murray beats Novak in straight sets. He will not read for few days. He is only going to write. I really hope they meet at the US Open. The USO favors Nole's game. I hope they meet at the Australian Open. What is still a question is who will be the other player that Nole is going to beat! Anyone fresh would have beaten Djo today, especially Fed of Raf. When was the last time Federer beat Djokovic at Wimbledon? Was it after second world war or before? It’s an excellent question. And these questions drive forums like this. My take: I’d say that Fed would have been very fired up for a match against Nole. Going into Wimbledon, absolutely no one would have predicted a Djokovic resurgence. Could Fed’s proper mindset (clearly lacking against Anderson) have made the difference? I say no. Fed 2017 would have beaten today’s Novak in 5 I say but he’s not close to his 2017 form so I think that he would have lost in 4 most likely. Fed’s 2018 form has moved in the opposite direction from Novak’s. I fear that we are about to enter 2013 again for Fed. I expect him to take some time off and maybe play 1-2 tournaments total besides the USO. Fed would of been beaten convincingly. For him to of beaten Djokovic today, the price to pay would have been a few weeks in a military mental hospital, with the 1000 yard stare in his eyes. Lets assume Fed serves well ı am not sure his baseline play can be right up there to beat Djokovic. LOL..Sure. Federer and Nadal are pigeons with a bunch of slams more than him. You don't have even little shame to vanish when the chips were down and show up just now ? Just a tiny bit ? A two sets to love lead and MP...The Fedovic final was one point away from happening, all due respect to Isner, but Federer would have dealt with him on Center Court. It would not have been his first with the bigger racket, he got the bigger racket back in 2014, so played both Fedovic finals with a larger frame. He's made room for Nadal yesterday. Maybe the Fed of last year, 2014/2015 Fed took it close with prime Djokovic and though Nole looks virtually back to that level, he still must have had some doubts until he was holding that trophy - I don't think he's been quite back to his best. Fed has fallen off of a cliff since the AO. He is playing like a guy that is ranked 5th in the world, not 2nd. Blowing a 2 set lead to Anderson at Wimbledon was one of the low moments for me(as a fan of his). He had insane moments in 2017. In 2018, he had a fortunate draw until he faced Cilic in the final. Since then, it has been a tough year. 2018 Fed loses in 4 sets to Djokovic at this Wimbledon. 2017 Fed beats 2018 Djoker in a 5 set nail-biter at Wimbledon. With all of that being said, I think that age has finally caught up to Federer for good, unfortunately. And this time, he cannot bail himself out by switching rackets like he did in 2014. He is clearly a step slower. He couldn’t out-rally Anderson from the baseline. It seems like it was 10 years ago when Fed was bullying Rafa on hard courts. But that was just last year. Now, Coric and Anderson are bullying Fed on grass courts! Fed got his 20th slam title and he is done winning them. As I said before, somebody will break that record. It has been a great run as a fan. Thanks Federer for all of the great memories. Part of me wouldn’t be surprised if he retired after the end of this year. What more does he have to accomplish? 20 slam titles, 310 weeks at #1, and over 200 wins against the top 10 are all absurd records. I would have liked to see him bag career title #100. But that is all right. It has been a great career. If another player that comes along that becomes my favorite happens to match Fed’s resume, I will be ecstatic. A couple years back Djoko was like a machine: the terminator of tennis. I was not really a fan. But in 2018, he seems much more human, more vulnerable, and yet his Wimby run was awesome. To me, Federer looked just fine, until he lost that MP against Anderson. He was purring all over the court in the first four matches, won like 34 straight service holds, forehand was lethal, the backhand was coming back. He just played a very bad few sets against Anderson, after losing that MP. Had he been back on Center, he would be just fine, and we would have got the match. How many could have seen him cruising to MP, and then all of sudden losing three sets with a dramatic loss of form. I'm not sure he was really tested before his QF though. Also he's had this issue this year, losing matches when he's had match points, or just losing focus and not being able to get it back. Being 2 sets to 0 up and losing is very strange, like his loss to Tsonga in 2011.. it was like there was no sense of urgency even though he had 3 sets to then get the set he needed. Yes it was a real shame. It was a truly dreadful loss. I'm confident he would have beat Isner. But then again, maybe Anderson did us a favour as I would much prefer him lose to Anderson than lose another final to Djokovic. Federer seems to lose a lot of matches from winning positions. Does he just lose concentration or something? Seems odd. When was the last time Djokovic played Federer? You know, the Fed who cleaned everyone's clock from January 2017 until January 2018. Did you watch the tennis? Many of us saying this was Wimbledon 2011 redux. Federer loses to someone after being two sets to love up, Nadal defeats Del Potro, Djokovic defeats Nadal on route to the Wimbledon title. Next year, a 2012 redux plez? I feel as if I ought to know this. Considering 1) Federer's loss to Coric and 2) how he seemed to carry that form into the Anderson match, my guess is no. But it's hard to tell how influential Anderson's power was. You do know we are kind of getting a 2012 redux here already? Djokovic, Nadal and Federer won the first three slams of 2012, they have also won the first three slams of 2018. We had a Djokodal epic in 2012, we had one in 2018 also. This year's Fed at Wimby started really good and it looked like it was 2017 Wimby all over again but then the performance vs Anderson came where he showed some shaky level that I think Djokovic could pounce on. But it's hard to say, pure speculation. 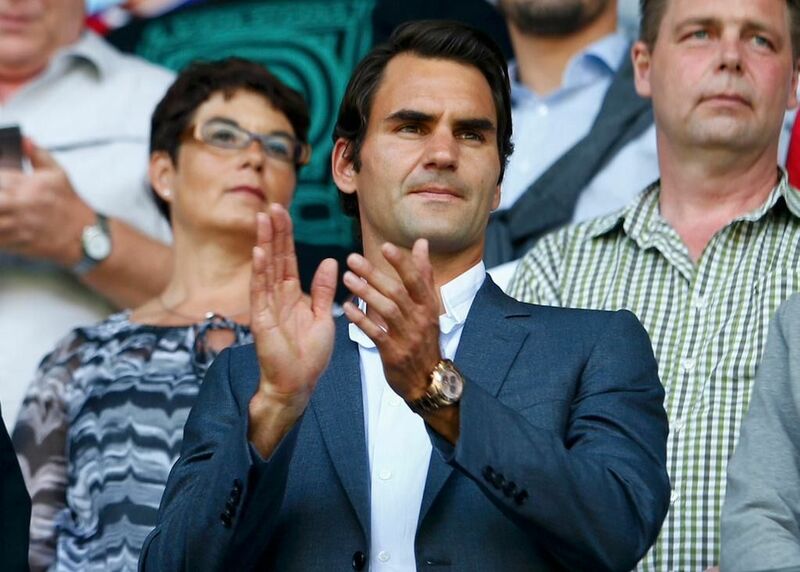 To me, Federer looked just fine, until he lost that MP against Anderson. He was purring all over the court in the first four matches, won like 34 straight service holds, forehand was lethal, the backhand was coming back. He was sharp, and had been the entire tournament. Most of the discussion about Federer was if he'd rather face Djokovic or Nadal in the final. Now the discussion is all about him looking old. If Murray did win US 18 it would have to count as the greatest comeback of all time. Exactly. It is funny how quickly that is all forgotten. I had him in the final and winning it, that shocking drop off was crazy. Federer went into free fall from what seemed to be a routine straight set win. No, Djok wasnt that worse than 14/15 level really.